Running back Jonathan Dwyer, No. 20 of the Arizona Cardinals, scores a touchdown in the first quarter against the New York Giants during a game at MetLife Stadium Sept. 14, 2014, in East Rutherford, N.J. 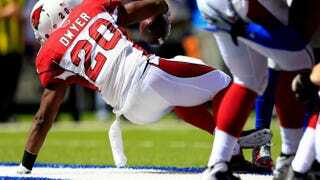 Details are surfacing as to what actually took place on the two July nights in question that led to Arizona Cardinals running back Jonathan Dwyer's arrest Wednesday. According to a police report viewed by ESPN, on July 21 Dwyer allegedly " … head-butted his wife after she refused his sexual advances and broke her nose." On July 22 the couple were involved in another dispute that reportedly included Dwyer punching his wife in the face and hitting his 18-month-old son in the stomach with a shoe, ESPN reports. Dwyer's son was not injured in the incident. Dwyer denied the assault in a police interview but did acknowledge " … that he punched walls in his home, threw a phone and that his wife bit his lip during the disputes," according to ESPN. The 25-year-old running back was banned from all team activities; he was also booked into Maricopa County Jail on Wednesday and freed early Thursday after posting $25,000 cash bond. Dwyer has been charged with " … one count of aggravated assault causing a fracture, one count of aggravated assault involving a minor, two counts of criminal damage, one count of preventing the use of a phone in an emergency, and assault," ESPN notes. Dwyer must wear an electronic monitoring device and cannot have contact with the alleged victims. He is prohibited from leaving Arizona and cannot have involvement with weapons, drugs or alcohol, ESPN reports.